Your customer / client has set you a design problem (see your customer / client sheet). 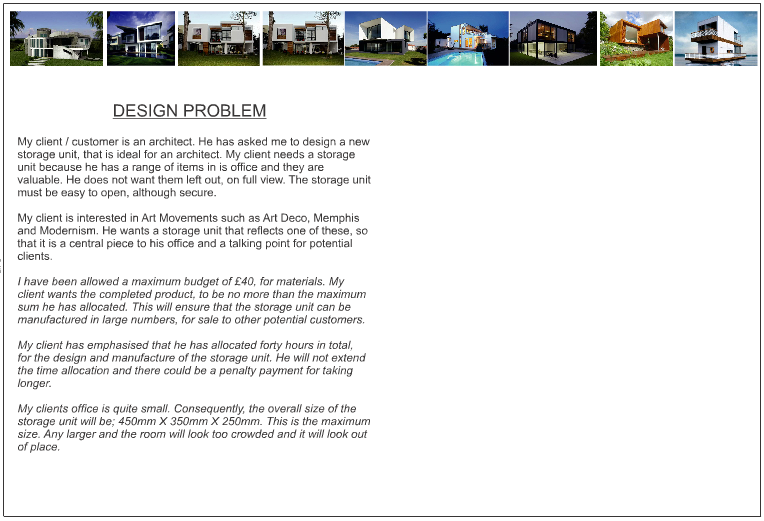 Answer the following questions about the design problem that you have been set by your client. DO NOT include any information about how you intend to solve the design problem. This is a good way of starting to write the ‘Design Problem’. Describe the problem that your client / customer has asked you to solve. E.G. My client is an architect. He has asked me to design a new storage unit, ideal for an architect and in keeping with his job. Explain why your client needs the product he/she has asked you to design and make. E.G. My client needs a storage unit because he has a range of items in his office, that need storing securely. They are valuable and he does not want them left out, on view. E.G. He needs to be able to access the stored items easily. Does your client / customer have an special requirements? E.G. My client wants the storage unit to look interesting and he wants the design to be based on an Art Movement, such as Art Deco, Memphis and Modernism. E.G. He wants the storage unit to reflect the type of work he does. E.G. He wants the storage unit to be a centre piece to his office and to be a talking point for clients. E.G He wants the unit to be colourful and very different to existing units. What are the cost limitations of your design and make project? E.G. I have been allowed a maximum budget of £40, for materials. My client wants the completed product, to be no more than the maximum sum he has allocated. This will ensure that the storage unit can be manufactured in large numbers, for sale to other potential customers. What is the time limit set by your customer? E.G. My client has emphasised that he has allocated forty hours in total, for the design and manufacture of the storage unit. He will not extend the time allocation and there could be a penalty payment for taking longer. What are the size restrictions of the product, you are going to manufacture for your client? E.G. My clients office is quite small. Consequently, the overall size of the storage unit will be; 450mm X 350mm X 250mm. This is the maximum size. Any larger and the room will look too crowded and it will look out of place.